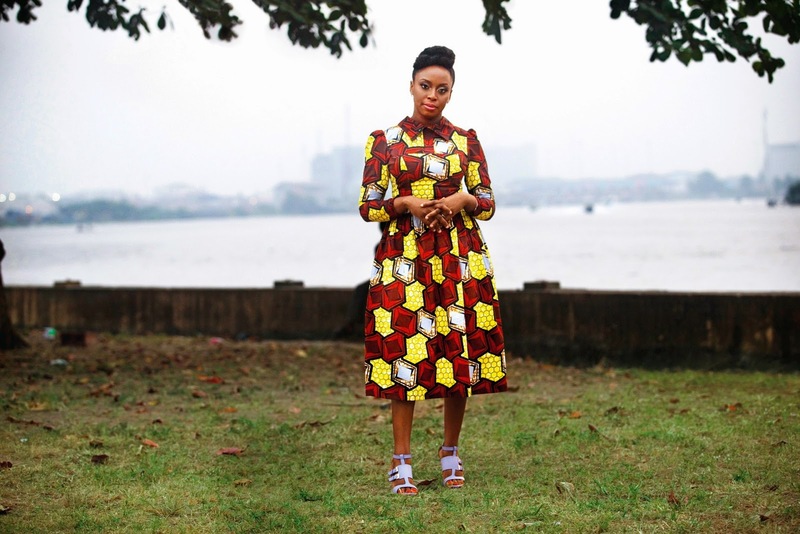 Chimamanda Ngozi Adichie is in the April 2015 issue of Vogue, in addition to her daily outfits photo shoot for the magazine. 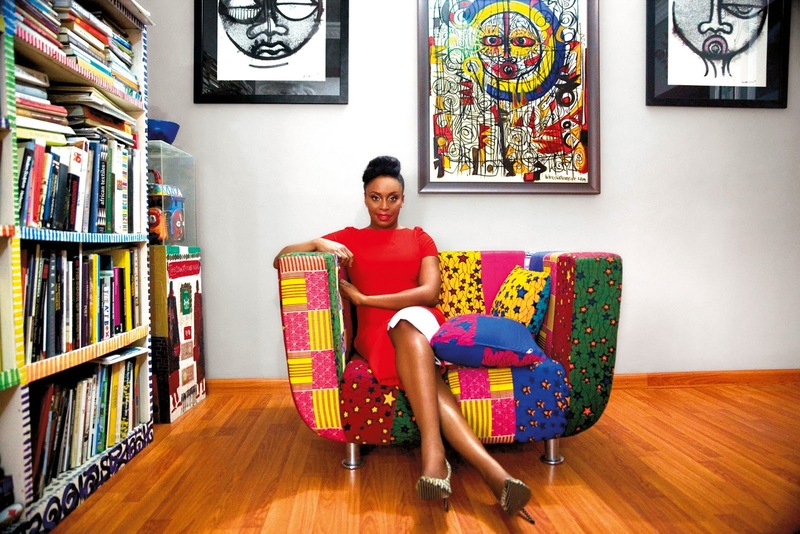 In the April edition of the paper, Chimamanda talked about various things, including being a writer and a feminist, her work being sampled by Beyonce, and about her husband, Dr Ivara Esege. He is a professor of medicine in Baltimore where they have a home in addition to their house in Lagos where she spends more than half of the year. On the little things he does to show her love though they live separately a lot of the time, she say; "I do all these drawings for my clothes. Really terrible drawings. But I love to do them, and he gave me the crayons so I could add a little bit of colour." Read excerpts from the feature below and check out the full essay by Erica Wagner on Vogue. "the nameless women in the market, who are holding their families together. They are traders and their husbands are out drinking somewhere... It's those women I admire. I am full of admiration for them." "I can't not be angry. I don't know how you can just be calm. My family says to me, 'Oh, you're such a man!' - you know, very lovingly… But of course I'm not, I just don't see why I shouldn't speak my mind." "I thought, I don't have anything to talk about. I'm not the kind of person who can manufacture things when I don't care deeply about them. But my brother said, well, there is this one thing you give us endless lectures about…Because it's known in my family, you don't want to demean women in my presence! And I knew this wasn't a comfortable subject, particularly for the people I was addressing, an African audience. "I was still writing it when I went up to speak, and afterwards, clearly people had listened, clearly people felt strongly about it - but I let it go. So they put it online, and only then I heard about people using it in their classes, about people arguing about it at work and school." "I am a person who writes and tells stories. That's what I want to talk about. There's an obsession with celebrity that I have never had. But the one thing I will say is that I really do think Beyoncé is a force for good, as much as celebrity things go. I know there has been lot of talk in the past year about how feminism is 'cool' now, but I think if we are honest, it's not a subject that's easy. She didn't have to do this, she could have taken on, I don't know, world peace. Or nothing at all. And I realise that so many young people in our celebrity-obsessed world, well, suddenly they are thinking about this. And that's a wonderful thing. So I don't have any reservations about having said yes." "It was the lack of gratitude on my part for having a husband. And yet I didn't want to proclaim it: I wanted to claim my own name." "'Oh, you say you are such a proud Nigerian! But how can you be if you don't like this?'" "Why pay for it if you can't see it? That's the thinking!" On having difficulty finding the right shade of foundation for herself in Europe. "Oh, yes, I always carry my own base with me. "In Nigeria I'm not black. We don't do race in Nigeria. We do ethnicity a lot, but not race. My friends here don't really get it. Some of them sound like white Southerners from 1940. They say, 'Why are black people complaining about race? Racism doesn't exist!' It's just not a part of their existence." "Somebody sends a limo to pick me up, and I just notice an attitude that the white, older male driver has. He's thinking, that's who I'm picking up? And I can't help thinking, if I were white, would he have a problem? If I were black and male, would he have a problem?" "I want to make it valid, to dream about books and writing. Because in Nigeria it's very hard; people will say to you, what do you mean, 'writing'? Nigerians are a very, very practical people. And while I admire practicality, I feel we need to make a space for dreaminess. But life is short. I'll say, don't give up your job. Get up earlier, make the space. If it matters to you, make it matter. I wrote Purple Hibiscus when I was an undergraduate. I was my sister's unpaid housekeeper, I was cooking, taking care of my nephew - I got up at 2am to write."